Enjoy dinner and music with your special Valentine on Wednesday, February 14. Edward’s Steakhouse, located at 107 Franklin Street, in the heart of Historic Downtown Clarksville, will offer three (3) seating options by reservation at 5 PM, 7 PM, or 9 PM. Local photographer, David Smith, will be on hand to take your picture if you like and photos will be ready for you to take home at the conclusion of your meal. 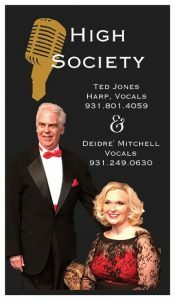 While enjoying Edward’s award-winning menu, accompanied by piano music, you will enjoy a special musical presentation by HIGH SOCIETY. HIGH SOCIETY is a one-of-a-kind vocal duo that combines the retro look and stylings of Big Band era singers with the contemporary sounds of an all-electric harp! the duo becomes a trio when Ted plays his bright blue harp for an evening that is classy, nostalgic, and unique. For more information and reservations, please contact Edward’s Steakhouse at (931) 906-8877.